We know it’s not easy keeping the wood in your garden in tip-top condition. 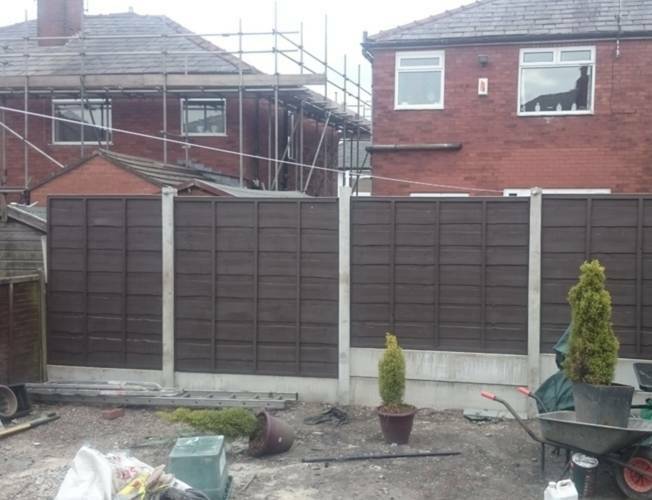 And while it can be time-consuming, choosing the right products can help make the job a breeze – improving the look of your home and longevity of your fencing, shed, windows, doors or other garden furniture. Best if you’re looking to weather-proof the outside of your home with paint. Can also be used on PVC and metal exteriors. Ideal for outdoor garden buildings such as sheds and log cabins that need water-proofing and protection against moisture. Our favourite timber primer, tailored specifically for outdoor wood. Comes in two shades for light and dark paints. The undisputed king of exterior wood paint, Garden Shades has been the #1 product in the industry for a long time – and for very good reason. With such a broad spectrum of colours to choose from (over 40 in the range) you’ll be hard pressed not to find a shade you need. It’s perfect for garden furniture, outdoor buildings and pergolas – but also suitable for sheds, fencing and even decking! This broad variety of uses means it’s perfect for colour-matching timber in the garden. Cuprinol will cover existing stains well, so it’s a great choice no matter how long you’ve left it since the last coating or treatment. It also includes preserver to keep your wood looking its best the whole year round – and the matt-finish really allows the grain of the wood to show-through. Garden Shades is available in 1L, 2.5L and 5L tins, meaning it’s fairly easy to order the perfect amount you’ll need. You’ll be able to get roughly 10M² coverage per litre, so it should be fairly easy to estimate the amount of paint you’ll need. So why is this our favourite product? Quite simply the finish looks stunning, the coverage you get from one tin is huge and the range of products is second-to-none. Check out our best price below. Top Tip: Cuprinol Ducksback is also a good option for exterior wood. While it may not be available in a huge range of colours, it does offer added protection against the elements – particularly if you’re painting a garden shed or timber fencing. Ducksback also comes with a handy 5 year protection guarantee, for those who want their new colour to last a long time. 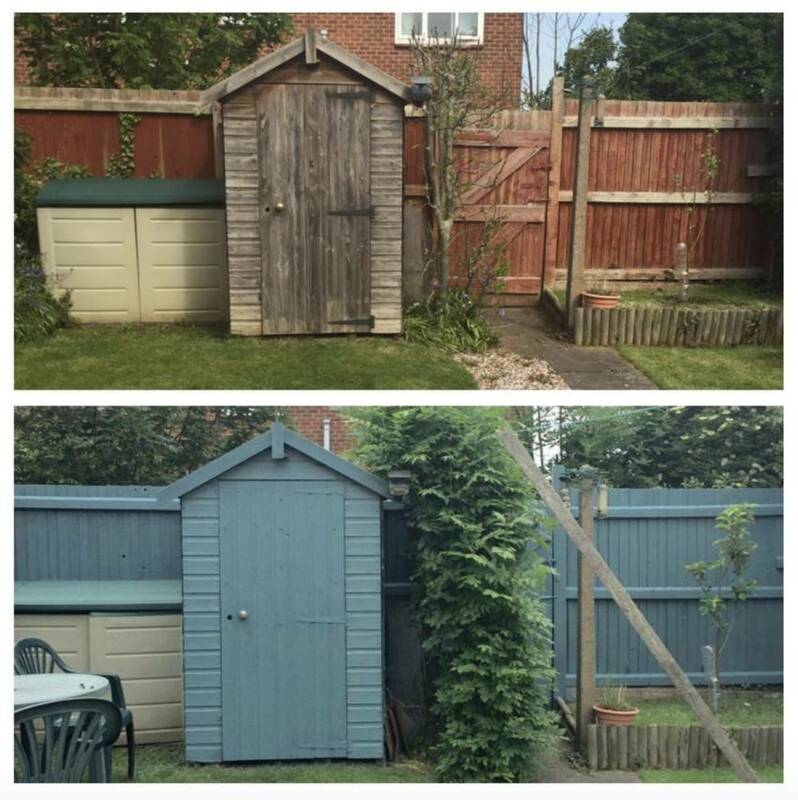 Johnstone’s Woodworks is specially created for sheds and garden fencing. The matt-finish product is water-based and sits incredibly well on sawn timber which has rough surfaces and splintered wooden edges. It comes in 5 different shades of brown: Acorn Gold, Dark Chestnut, Dark Oak, Ebony and Light Brown. Great if you’re looking for traditional colours for your shed or fencing; but you may need to look elsewhere if you need something a little brighter. We recommend you only apply this product with a brush. Using a sprayer is not likely to help the paint soak as deeply in the wood as it needs to in order to adequately protect the timber from fading and rot. It’s also too thick to spray on. The Woodworks range is limited in terms of the colours available, all of which are different shades of brown. For this reason if you’re looking for something brighter, you’d be best looking into Garden Shades. With an average coverage of 6M² per litre, you’ll also get less out of a tin than with other brands. 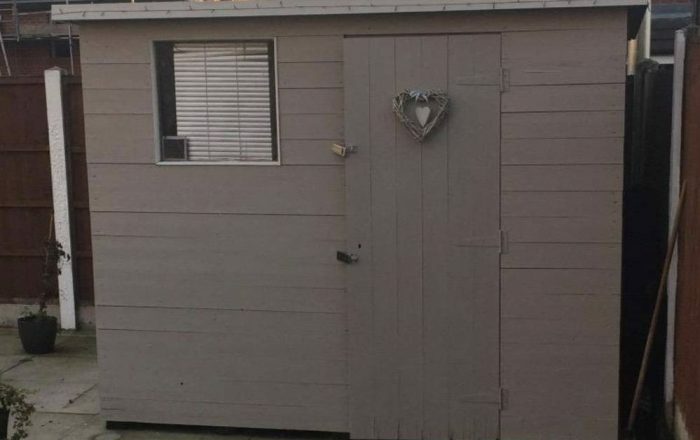 However this is a compromise worth accepting if you’re looking for a quality product for your shed or fencing. Dulux Weather Shield has been specially formulated for the outside of your home. It’s been created for use with any type of surface – metal, wood or PVC. This makes it ideal for timber housing, doors and window frames. Given it can be used on plastic, it also makes it suitable for PVC framing on windows and composite doors. The paint is oil-based which gives it a stunning gloss-effect after being left to dry. It’s available in five basic colours: black, white, green, grey and dark grey. Dulux promises a 10 year guarantee for protection against the elements. Generally you’ll need at least two coats to ensure adequate preservation. Sadly we haven’t had 10 years to test this guarantee but from what we can tell from the product we’ve tested it’s holding up pretty well! If you’re planning on using your paint on sheds, garden furniture or fencing, this is probably not the product for you. The gloss product doesn’t sit well on sawn timber. Because of this we’d advise looking into one of our other options. However if you’re painting your house, you won’t find a better product than this one. A little more expensive than other exterior paints – but you get what you pay for! Not strictly a paint but still one we needed to include in our list. It has a waxy finish and is water-based, making it perfect for log cabins, sheds and other garden buildings where protecting against the elements is crucial. The wax finish acts like a seal against moisture, which will simply bead off the surface rather than being soaked in to the timber. 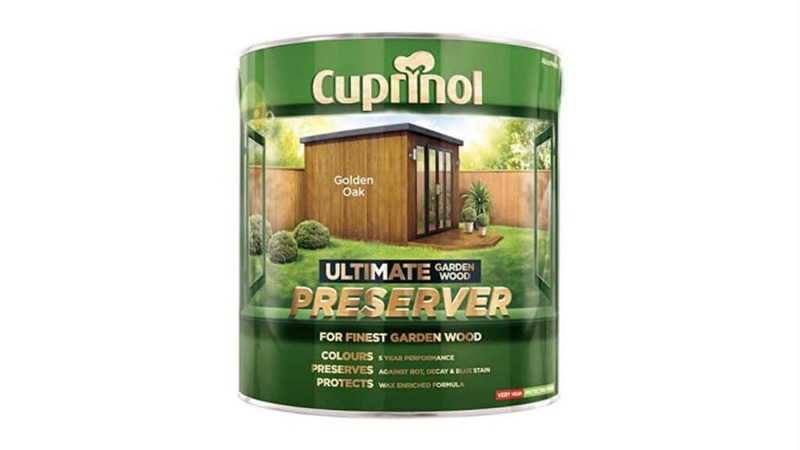 This product has excellent water-proofing properties and has to be your top choice if preservation is the big reason for painting your garden wood. It really does help keep rot and decay away! It comes in 1L and 4L tins – slightly unusual – but likely a result of the low coverage per/metre. At just 4M² per litre you’re going to need a lot of this paint if you’ve got some large surfaces to cover. However if it helps extend the lifespan of your garden buildings then it’s likely a worthy investment. We’d recommend applying with a paintbrush to allow the preserver to really soak into the wood. We haven’t tried using this product with a sprayer but given its consistency we don’t think it the wisest move. Similarly, a roller probably won’t work too well. If you do buy this product, make sure you leave a few hours free for some handy-work in the garden! It usually takes between 4-6 hours to dry once applied, though it can be quicker in warm weather. Top Tip: Where possible you should always buy the best outdoor wood paint you can afford. Higher quality paint is easy to apply, will look better and last longer – making it incredibly economical in the long-run. Check out What Paint if you need more specifics on the type of paint you might need for your surface type. 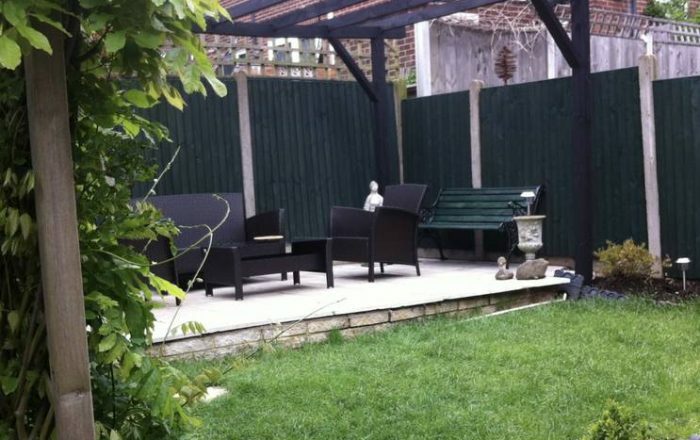 Before painting your garden timber you’ll first need to prime the surface. This preparation is key as it will strip the surface of any old paint and once dry, will leave the timber in a great condition to receive the paint. Ronseal’s Flexible Wood Primer has been specially formulated to work with all exterior wood buildings & furniture. As far as we know there is no other product out there that is purpose-built for outdoor timber. This primer works with all paint types – whether you’re using a matt, eggshell, gloss or wax product, you can trust this product to lay a perfect base coat before applying. It comes in either grey or white, so you can choose the right coloured base that’s going to match your new paint. Generally the white primer is best for lighter paints, while the grey works better with darker paints. You’ll probably need two coats to achieve an even coverage, with the product averaging 10M² per litre. That means a standard 750ml tin should do 7/8M². If needed this product can also be used with interior wood, so worth keeping in storage if you don’t use it all. Happy priming! You should only ever paint in dry weather. If the timber is wet before you start work – forget it! Wait for a dry, sunny day. If your timber has already been painted in the past, use a paint stripper to remove any existing paint that is likely to get in the way. Depending on the age and quality of the wood you may wish to sand the surface down – but this is likely not necessary with newer timber products. Use a quality primer to lay a foundation for your paint. Generally white primers work best with light colours and dark grey primers work better for darker colours. Allow at least 24 hours to dry before painting. Read the manufacturer’s instructions on the side of the tin before getting started. Every paint is different and will have very specific directions for application. Generally exterior wood paint is best applied with a paint brush, to allow it to fully soak into the wood. It also means you’ll reach every nook and cranny, helping to form a protective seal on the surface. Paint with the grain for best results. You’ll need at least two coats to achieve an even coverage, but you may need three in some instances. Most gloss and matt paints will dry within 2-4 hours, while preservatives usually take a couple of hours longer. You should be able to finish the whole process in under a day; depending on how many surfaces you need to paint.